The purpose of these forms is to enable IRS to reconcile subsidies to individuals who obtain health coverage through a Health Insurance Marketplace with information reported by employers and to verify whether the employers of these individuals are subject to penalties under the Employer Mandate provisions of the ACA. These subsidies, in the form of premium tax credits or cost sharing assistance, are granted to lower-income individuals who obtain health coverage through a Marketplace. If these individuals are employed and are not offered minimum essential coverage by their employers, and/or that coverage does not meet minimum value or affordability thresholds, the employer can be subject to penalties. Employers who do not offer their full-time employees coverage that meets these thresholds may be subject to Employer Mandate penalties. For 2015, these include a non-tax-deductible penalty of $2,080 for each full-time employee who is not offered minimum essential coverage if at least one such employee obtains a subsidy. There is also a penalty of $3,120 for every full-time employee who is not offered affordable and minimum value coverage and who obtains a subsidy. When a subsidy is issued to an employed individual, a notice is sent to the employer about the potential penalty. The employer then has 90 days to appeal a subsidy that was erroneously granted. 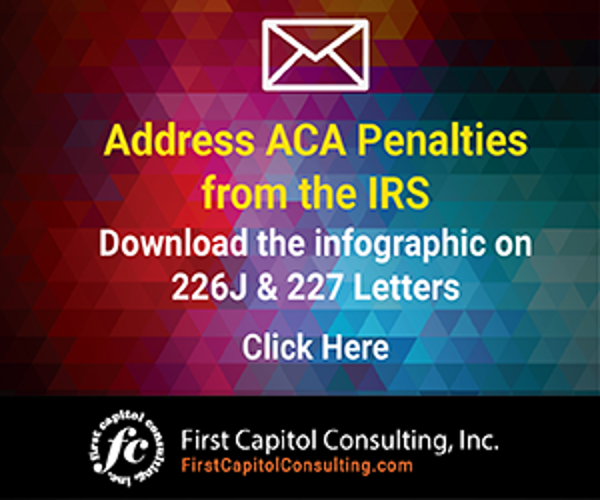 In addition to the Employer Mandate penalties, the ACA can also trigger reporting penalties. For example, failure to file the 1094/1095 schedule forms can result in hefty penalties. Penalties can be imposed for failing to file correct and complete information in a return, or for failing to furnish complete and correct information in payee statements. These penalties were substantially increased as a result of a change in the law that went into effect on June 29, 2015. The penalty for failing to file forms on time, and/or failing to file correct and complete information, is $250 per return. (Prior to the June 29 change in the law, this had been $100). The cap on all such failures is now $3,000,000 (previously $1,500,000). This increase in the cap also applies to penalties for the failure to furnish complete and correct information in the payee statements. Reporting penalties can be reduced if the employer files corrected returns by certain dates. If the corrections are made within 30 days after the required filing date, the penalty of $250 is reduced to $50 per return (previously this had been $30), with a maximum of $500,000 (previously $250,000). If the corrections are made by August 1, the penalty is $100 per return (previously $60), with a maximum of $1,500,000 (previously $500,000). The cap on total penalties is lower for employers with gross revenues of not more than $5,000,000. This cap is $1,000,000 (previously $500,000) for failing to timely file and/or failing to file correct and complete information, $175,000 (previously $75,000) for corrections made within 30 days of filing deadline, and $500,000 (previously $200,000) for corrections made by August 1. 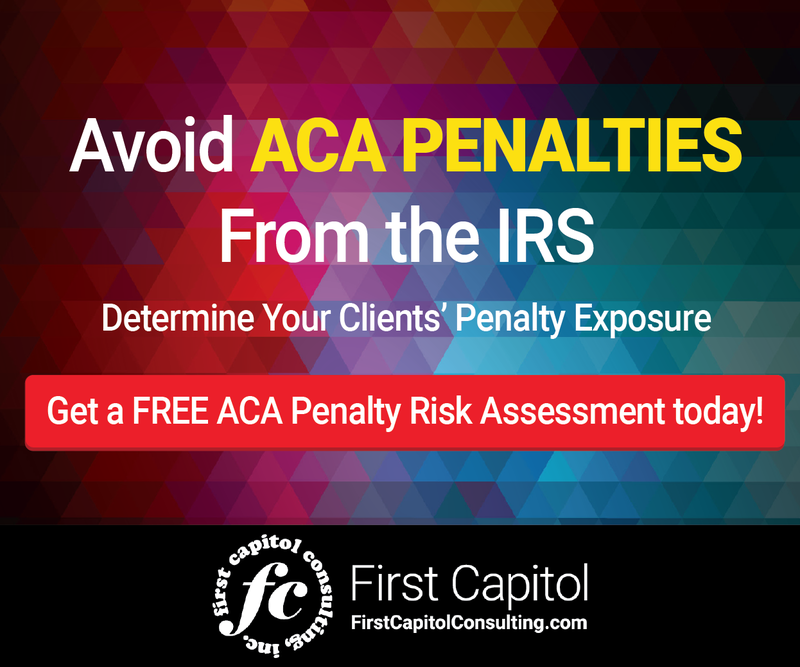 If an employer is found to have intentionally disregarded ACA reporting requirements, penalties are to $500 per return (previously $250), and there is no cap on total penalties. So, what kinds of information will you have to collect in order to complete these 1094/1095 schedules? Generally, you will need data pulled from your company’s human resources, payroll and employee benefits departments. HR data required will include information about the company’s policies regarding eligibility for healthcare coverage, such as waiting periods and any orientation periods. Payroll data should include each employee’s hours of service, wages, hire and termination dates, and the dates of any unpaid leave. Employee Benefits should provide the type of health insurance coverage the company offered, when it provided each employee with notice of an offer of coverage, whether spouses and/or dependents are covered, the specific benefits provided under the offered coverage, and the costs for this coverage to the employee. As an employer, you will have to fill out and file forms in the 1094 and 1095 series. Forms 1094-B and 1095-C must be distributed to all applicable individuals (employees and possibly their spouses and dependents) by January 31, 2015. These forms, along with the corresponding transmittals consisting of Forms 1094-C and 1094-B, must be filed with the IRS. The deadline for filing is February 29, 2016 if you file on paper, or March 31, 2016 if you use electronic filing. Employers with 250 or more returns must file electronically. For employers, the requirements for filing forms in the 1094 and 1095 series will vary depending on whether the employer’s health plan is fully funded or self-funded, and whether the employer is deemed to be an Applicable Large Employer , or ALE – that is, an employer with at least 50 full-time or full-time-equivalent employees (FTEs). The 98% Offer Method, which applies to ALEs that offer coverage that satisfies both affordable and minimum value requirements to 98% of all full time employees. The transition relief only applies for the 2015 tax year. Form 1095-C is both filed with the IRS and distributed to each applicable employee. The return must include identifying and contact information for each full time employee, identification and nature of the Qualifying Offer, and any application of Section 4980H safe harbor for each month. whether an offer was made to an employee who was not full time and who enrolled in self-insured coverage. whether coverage is through a multi-employer plan and if so, the details of that plan. Self-insured ALEs have the additional requirement of providing identifying information about each covered individual, including spouse and dependents. This includes each person’s social security numbers or, if unavailable, date of birth, and months of coverage. Insurers and self-insured non-ALEs must file Forms 1094-B and 1095-B forms. 1094-B is a transmittal identifying the filer and the number of 1095-B forms submitted to the IRS with the transmittal. 1095-B is a disclosure form that must be provided to each insured employee. Required disclosures include the identification of the plan, each covered individual, his/her information, his/her covered spouse and dependent information (social security numbers or dates of birth if SSNs are unavailable), and the months of coverage for each covered individual and his/her spouse and dependents. The disclosures, consisting of Forms 1094-B and 1095-C, must be distributed to all applicable individuals by January 31, 2015. These forms, along with the corresponding transmittal Forms 1094-C and 1094-B, must be filed with the IRS by February 29, 2016 if filed on paper, or by March 31, 2016, if filed electronically. Employers with at 250 or more returns must file electronically. Yet another ACA reporting-related form is 1095-A, which employers should be aware of but do not have to prepare; Form 1095-A is filed by the Health Insurance Marketplaces. The 1094/1095 schedules are intended to enable the IRS to reconcile with an individual’s reporting of healthcare coverage, including whether the individual properly obtained a premium tax credit. These premium tax credits can trigger the imposition of Employer Mandate penalties. If the IRS audits your ACA-related filings, it is important for you to have documentation supporting your 1094/1095 schedules. For example, if an employee has reported that he or she was not offered coverage, the employer will need to show that it did make such an offer to the employee. Potential proofs of offer of coverage may include such documents as a form acknowledging the offer, a summary of benefits and coverage, and a payroll summary. On the acknowledgement form, the timing of the date of the offer and the date when coverage will take effect are both important. The form should also include the cost for self-only coverage and whether spouses and/or dependents are covered. The summary of benefits and coverage should include a statement by the insurer that the coverage satisfied the minimum value requirement. A payroll summary may be necessary to show that the cost of coverage satisfied the affordability threshold. Notably, prior to an IRS audit, an Exchange is expected to send the employer a notice indicating that an employee has claimed a premium tax credit because the employer failed to provide the requisite offer of coverage, the coverage did not meet minimum value, or it was not affordable. The employer has only 90 days to dispute the claim with the Exchange. Accordingly, it is key to have documents ready to prove that an offer was made to the employee that satisfied these ACA requirements. This content is for general information purposes only, and should not be used as a substitute for consultation with legal advice.